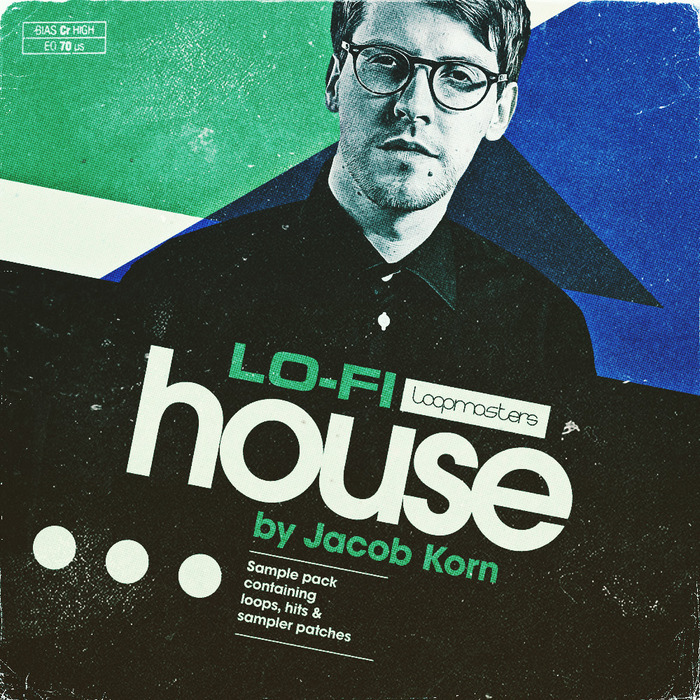 Loopmasters present Jacob Korn Lofi House, a vintage collection of old school House and Techno Samples using the seminal gear which made the sound and the scene. All content is 100% Royalty Free to use in your music, delivering the sound and the heartbeat from Berlin to Detroit. Jacob Korn is a dedicated producer, who rediscovered the purity of House and Techno through a musical journey spanning New Jazz, UK Breaks, IDM, Hip Hop and Ambient. Following a string of tracks, remixes, and EPs for Permanent Vacation, 4Lux and Running Back he found his new home at Uncanny Valley, a label run in Dresden, Germany. Jacob has shared stages with artists like Underground Resistance, Kelli Hand, Mike Huckaby, Chez Damier, Tevo Howard, Basic Soul Unit and Sven Väth. Jacob Korn brings you over 1.3GB of content with Loops, One Hits and Sampler Patches to inspire a full on Lo Fi House revival. A weighty selection of over 300 Drums loops is included, with pumping Full Loops, refined Percussion, crafted Top Loops and sliced up Stripped Loops with Kicks and Snares for to lay down the groove. Over 40 rolling Basslines with 66 Chords, Leads and Melodies ensure you have all the ingredients for a heavily melodic mix! In excess of 440 One Shot samples have been included with Bass, Chords, Synths, FX and Drums with Claps, Snares, Kicks, Hats and Percussion to get your teeth into. 14 Multi Sampled Instruments are also included to deliver immediate melodic inspiration from Jacob?s studio and from the included 97 Sampler Patches! All melodic content is key-labelled for immediate integration in your music. Jacob adds: I used synths, samplers and drum machines together with outboard FX to get gritty, Lofi textures you?d only find on vinyl records or old master tapes, and almost impossible to achieve on a computer. So if you are an upcoming producer in the Lo Fi House territory you will find a solid foundation to start your own creations. Jacob employed the use of: Formant 70s Modular System, Roland Space Echo, Roland TR909, TR707, Juno60, Mks7, Korg Polysix, Sequential Circuits Sixtrak, Fender Chroma Polaris, Akai MPC 1000, Studer A 820 Master Tape, Revox Tape Machine, Waldorf Microwave 1 and Alesis HR-16. At tempos from 120 to 123 BPM, Jacob Korn Lo Fi House is ideal for all forms of House, Techno, Old School and many other Genres. In detail expect to find 1.31Gb of content with 880 individual 24 Bit WAV files. 438 Loops are included with 47 Bass Loops, 325 Drum Loops [79 Full Loops, 37 Kick Loops, 25 Percussion Loops, 18 Pitched Loops, 27 Snare Loops, 73 Stripped Loops and 66 Top Loops] and 66 Melodic Loops [17 Chord Loops, 31 Lead Synth Loops, 18 Melody Synth Loops]. 442 One Shot samples are included with 26 Bass Hits, 6 Multi Sampled bass Instruments [52 Samples], 17 Chord Hits, 161 Drum Hits [30 Claps/Snares, 36 Hats, 43 Kicks and 52 Percussions], 25 SFX, 25 Synth hits and 8 Multi Sampled Synths [136 Samples]. 438 Rex2 Loops and 97 Sampler Patches are included for NNXT, Halion, EXS24, Kontakt and SFZ. Jacob Korn Lofi House is a time capsule collection of vintage sounds, taken from the original gear, and sampled to perfection.